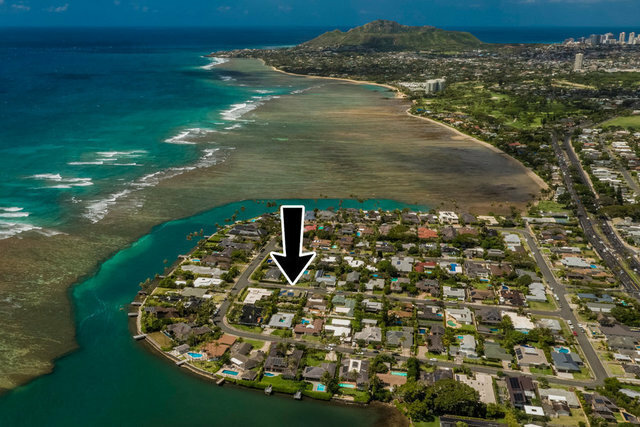 Stunning "resort style" four bedroom five bath residential estate, idyllically located along Oahu's south eastern shoreline within the Wailupe Circle Peninsula, a small enclave of 121 homes offering the ultimate in island living, private ocean access, swimming pier and small boat launch ramp. The properties architectural design captures Hawaii's indoor/outdoor living at its finest with a mix of formal and casual living areas centered around views and the sparkling deep blue tiled pool, strategically positioned between the main house and large pool cabana of over 862 square feet. Luxurious top of the line finishes throughout - steel frame construction, imperial plaster walls, marble and stone flooring, central air, vaulted ceilings, and custom doors. Capture your piece of paradise!